Schemes to ensure that farmers get fair returns will come a croppper unless trade and tariffs are synced with minimum support prices. Given that the “A2+FL” cost for paddy was estimated by the Commission for Agricultural Costs and Prices (CACP) at Rs 1,117 per quintal in 2017-18, its MSP for the coming kharif season can be safely assumed to be close to Rs 1,700. With farm prices of several commodities falling way below their minimum support prices (MSPs) in 2016-17 and 2017-18, farmers have been under increasing stress. The Centre and several state governments are searching for ways and means to support farmers. In his recent address (Mann ki Baat), the prime minister stated emphatically that his government will increase MSPs to cover “all costs” of farmers plus 50 per cent. He even went on to enumerate many items of farm expenditure. But what he recounted was basically cost A2+FL (paid out costs plus imputed value of family labour) and not cost C2, which is comprehensive cost including imputed rental value of owned land and imputed interest on owned capital. The big issue, however, is not just announcing higher MSPs but how to ensure that farmers really get it. Although the Centre regularly announces MSPs for 23 commodities (including Fair and Remunerative Price (FRP) for sugarcane), its implementation remains a distant dream. Except paddy, wheat and sugarcane in major procuring states, the announcement of MSPs remains largely indicative in nature. The Madhya Pradesh government tried to help farmers through the Bhavantar Bhugtan Yojana (BBY), a price deficiency payment (PDP) scheme, in kharif 2017. But it gave up abruptly in the rabi marketing season as the scheme could not cover even 25 per cent of the harvest, even though prices of most crops were way below their MSPs. The Centre is debating whether to scale up the PDP scheme or procure through private trade or look at direct income support (DIS) on a per hectare basis — along the lines of schemes announced by Telengana and Karnataka — for the coming kharif season. We examine here the potential costs of scaling up the BBY/PDP scheme and DIS at the all-India level. Scaling up BBY/PDP scheme requires reaching all farmers, registering their market arrivals, and paying them the difference between the MSP and market prices. We don’t see how it can be done at the all-India level, especially in states where there is hardly any system of registering market arrivals in mandis (like Bihar and much of UP), and where small farmers sell at the farm gate itself. But if it is done, and somehow a system is erected to reach all farmers, it is going to cost between Rs 43,700 crore to Rs 87,400 crore — a conservative estimate — depending upon whether the market prices are 10 per cent below MSPs or 20 per cent below MSPs. For many pulses and oilseeds, market prices are currently more than 20 per cent below their respective MSPs. In that case, the costs will be even higher. In calculating these costs, we multiply the net available quantity (marketed surplus) with price difference between projected MSP and likely market prices. We exclude basmati exports and its production, and procurement of paddy, wheat and sugarcane from our calculations for PDP. The MSPs for 2018-19 are projected by assuming a 5 per cent increase in A2+FL and C2 costs of 2017-18, and adding 50 per cent on top of these, as promised by the prime minister. The graph shows that even if cost A2+FL formula is followed for pricing, MSP of jowar will have to be raised by 40-45 per cent, cotton by 19-28 per cent, paddy, soyabean and groundnut by about 10-15 per cent, and so on, over 2017-18 MSPs. 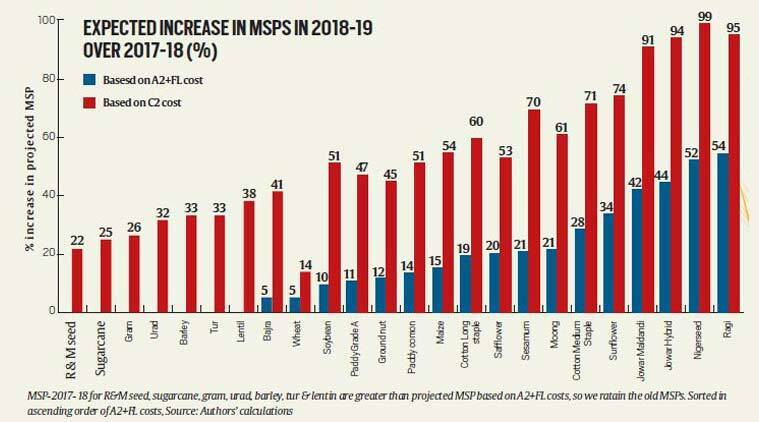 The increases in MSPs will be much higher if cost C2 is used as the relevant cost (for example, jowar prices will have to raised by 91 to 94 per cent), which may lead to mayhem in agri-markets. So, look before you leap! It is worth highlighting that cost plus pricing, which ignores demand side, will lead to major distortions in the system. For example, farmers will find jowar relatively more attractive and increase its production. Higher supply without any change in demand will create a glut and thus depress market prices, requiring either large-scale procurement by the government at enhanced MSP or a huge PDP. Similarly, higher cotton and paddy MSPs will make India less competitive in global markets, adversely impacting their exports. This, in turn, will increase supplies in domestic markets, necessitating massive procurement or large-scale PDP. Therefore, just cost plus pricing is not an economically rational decision. For some crops, current MSPs are greater than projected ones based on A2+FL plus 50 per cent. For these we retain current MSP — except wheat, for which the current MSP is raised by 5 per cent. This is because if paddy MSP is raised by 11 to 14 per cent in line with 50 per cent above cost A2+FL, it will be incumbent on the government to increase wheat price by at least 5 per cent, if not more. Else, it will have to face major political fallout in the northern states. In contrast, DIS is more transparent and less likely to be prone to manipulation. It is easier to implement, more equitable, and crop neutral. But if scaled at the national level, at say Rs 10,000/ha as Telengana has announced, DIS will cost Rs. 1.97 lakh crore to cover the total gross cropped area of the country. It can be cut to almost half of this amount if paddy, wheat and sugarcane farmers, whose produce is procured at MSP/FRP, are excluded. Yet, it may not be cheaper than PDP. So, the government is in a dilemma, despite its best intentions to help farmers. There is no short cut to long overdue agri-market reforms, notwithstanding the hype around e-NAM. Synchronising trade and tariff policy with the MSP policy has been neglected for long, and now farmers are suffering due to sloppy policies and empty slogans. There is no respite in sight for peasants in the near future, except may be some band aid as a result of knee-jerk reactions in terms of loan waivers or some income support.